The New Order was being transparent before transparency was cool. 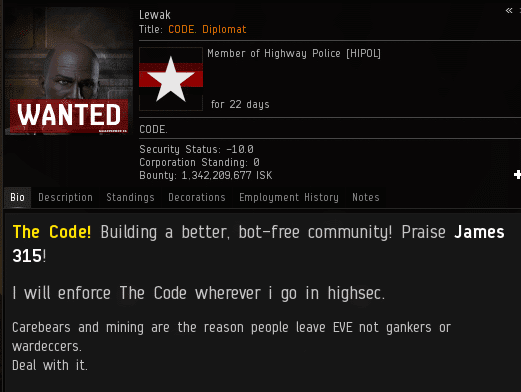 In the spirit of transparency, let's look at a typical EVEmail that a miner receives upon being ganked by Agent Lewak. Lewak is known as one of highsec's most effective communicators. He's able to take a complex situation and break it down into understandable chunks. It's so easy, even a miner can read it! First, Lewak summarizes the central conflict of highsec and introduces the solution to the problem. Next, the application: Our Agent elaborates on how the miner must respond to the world in which he finds himself. Finally, a call to action. Not bad, eh? So much for all the accusations of "griefing" and "harassment". The EVEmail you just read was sent to Tom Catz, an illegal miner who had his Retriever terminated for non-compliance. 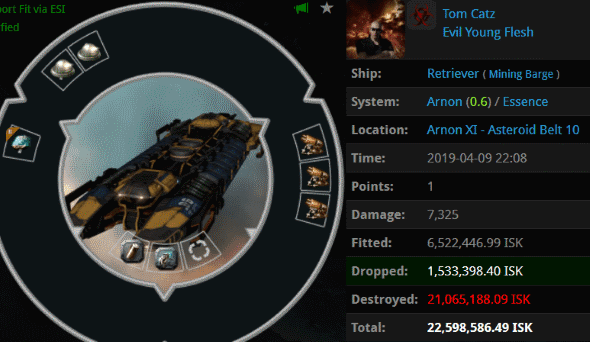 Despite the finely honed EVEmail that Lewak so expertly crafted for him, Tom reacted badly to the gank. Apparently the miner's reading comprehension was poor. Time to improvise. Since Tom was acting like a baby, Agent Lewak tried to hold his hand while he walked the miner through the process. If a carebear is very greedy, the thought of giving away 10 million isk can be very distressing. Tom wrapped up his greed in some disingenuous talk about "freedom". Miners, freedom means anyone can shoot at you. What you're actually looking for, I think, is something called "civilization". And civilization means following the rules. ...And by "the rules", I naturally mean the Code. A line had been drawn in the sand; the battle had been joined. On one side stood Tom Catz, a bot-aspirant miner who demanded absolute safety for his criminal enterprise. 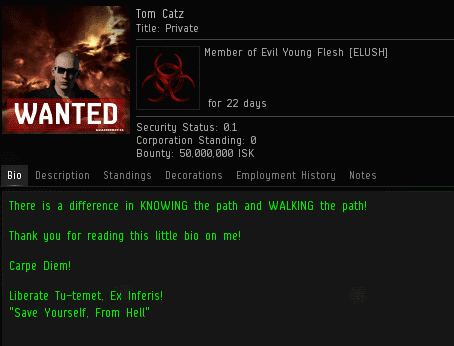 Opposing Tom was Agent Lewak, who represented all of the good people of highsec--past, present, and future. Popcorn out, this is gonna be good. Wow! 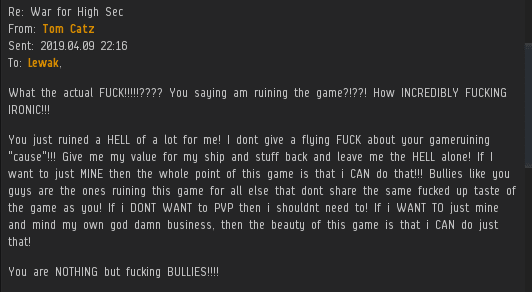 Heaven forbid that in the famously savage video game of EVE Online one should lose a ship unwillingly. Just kidding! Those were some spectacular tears. Tom should find some other game and stop ruining our civilization. 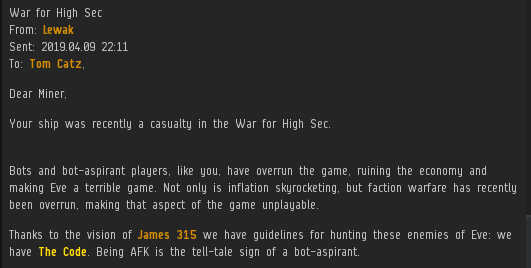 Praise James that His message attracts the very best players in eve to the New Order. Agent Lewak is no exception - a brilliant leader and dedicated soldier in the War for High Sec! Tom Catz is an alt of Balos/Traco, obviously. You are an irresolute yo-yo. They are more of meta roleplayers that does not care for the 4th wall. They'll compare themselves as something like police in the real world to justify their actions, but when miners compare them as extremist/dictators they'll play of the "it's just a spaceship shooting game" card.